The First Lady, Michelle Obama, is visiting South Africa and Botswana to bring focus to youth leadership, health, and wellness. A friend of ours, Alan Fitts, is her Trip Director, and blogged on the White House website about their first travel day, here. Mrs. Obama’s work with young women around the world is inspiring and bringing Sasha and Malia along on this journey is making it an extraordinary trip on all fronts. 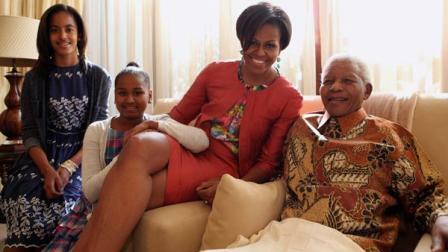 The family met with Nelson Mandela on their first day. Madiba (Mandela’s Xhosa clan name) has had some health scares, and was hospitalized when we were in South Africa in February, but as the figurative head of a nation and an entire age, a visit must have been a true high point, and likely a dream come true. Mandela is having one of his own dreams come true now as well. It was announced last week that a new high school will be built in his birthplace, Mvezo, in the Eastern Cape. The Mandela School of Science and Technology will go far above expectations and honor: the original budget was state-of-the-art and projected to be about $4 million dollars. Entrepreneurs from around the world have joined forces to support the effort, and the goal is being expanded (as is the cost, now nearly $14 million…but not due to waste, due to dreaming larger to “fulfill Mandela’s dream”). Boarding facilities, a sports center, library, and auditorium are included, to give the youth today chances far beyond those that the young Mandela who was born here could have imagined. ……..Reuters.FREEDOM African National Congress supporters hold up a poster to celebrate the 20th anniversary of Nelson Mandelas release at Drakenstein Correctional Centre…. South Africans are celebrating how far they have come since Nelson Mandela took his first steps to freedom 20 years ago..